Brennan Dunn was a guest on Freelance Transformation all the way back in FT 006: How to be a High Value Consultant with Brennan Dunn. 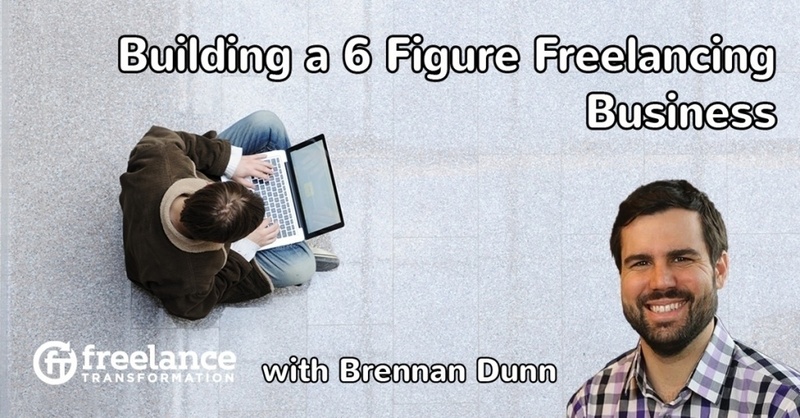 Brennan is back again in episode 75 to discuss what it really means to be a successful freelancer and how to approach building a sustainable 6 figure freelancing business. To celebrate this being episode 75 (thank you dear listener for being along for the ride) Matt and Brennan have a unique opportunity for FT listeners to receive some special bonuses when joining the Double Your Freelancing Academy. A full 7 month course with live instruction created for those seeking to build a real freelancing business. If anyone would know the answer to this question, it would be Brennan. Brennan has been offering courses to freelancers for years, from Double Your Freelancing Rate, and the Double Your Freelancing Academy. He has seen freelancers who are just starting out start making six figure incomes because they made they put in the effort into finding the right clients and changing their mind set. The biggest transformation that Brennan has observed in his successful students: They stop looking at themselves as technicians or temp workers and start seeing themselves as the providers of solutions. This is a huge mindset shift. And it is difficult, but completely worth the effort. Stop hoping that someone will knock on the door and say “I need someone like you.” That's passive and leaves you dependent, even desperate, on people coming to you. The successful freelancers look at business from a metric perspective and have an eye on the profits and loss sheet. They don't leave getting business up to chance or to a third party. They own their business. But freelancing isn't for everyone. If all you want to do all day is code or design or do your craft, then it might be better to be an employee where you don't have to worry about managing the business stuff. Being a freelancer means you have to market yourself, qualify new leads, pitch them, manage receivables, ... In total, you know, run a business. On top of doing your craft. First, let's talk sales funnels. A sales funnel is about getting people who fit the right profile in front of an acquisition channel or source. An acquisition channel can be a blog post, guest post, winbinar, in-person seminar, even podcast. A sales funnel should be scalar and evergreen. Scalar means that you are reaching many people at once. For example, you can run a 1 hour webinar for 30 people rather than have 30 individual 1 hour conversations. Evergreen means that the things you have done in the past are still relevant and get people interested in your offerings. The goal of these sales funnels isn't always to get a sale directly from the people who attend your seminars and read your blogs. A big part of it is actually to give away value in exchange for referrals. If you provide real valuable to the people in your audience, you become an expert in their eyes. You've taught them what a potential problem is in their business and what the solution can be, which is what you offer, whether they hire you or not, they got valuable insight into how their business works. That means at their next cocktail party when their friend is looking for a (fill in your craft here), then they will recommend you. Think about it. How often do you go to networking events and the conversation ends with an exchange of business cards and “Hey, let's keep in touch.” (Which translated means, nice to meet you, but I will never see you again.) What if instead you ask them if you can send them an email course that you made once you get back to the office? Now you have a valuable reason to follow up with them, you get them on your list and you might even get the sale. But how many clients can you actually handle every year? As a solopreneur, that number is probably somewhere between 3-10, maybe more if you start subcontracting. The value of the sales funnel is partially to get you direct leads and partially to increase your referral potential without selling. You want a lot of leads so you are in control of who you decide to work with. Because there is a limited amount of time, there is a limited number of clients that you can take on. Therefore, if you want to raise your rates, you have to increase the calibre of your clients, not the number of clients. Positioning is bringing to the forefront what you normally pitch in a project proposal. To make that less cryptic, let's use an example. You are selling a website to a hospital so, in the project proposal, you would use client-specific words like patients instead of customers and talk about successful recovery rates and the latest research at the hospital. Take all those key client-specific words and phrases and put them in marketing campaigns, make a specific landing page, make a micro-site focused on helping that kind of client. By niching down, you expose yourself and the solutions you have to offer to a narrow field filled with a lot of people. To the client, you are lower risk going with you, who already understands their industry and its specific problems. There is less competition for you and less shopping around for the client. Many freelancers have fears of niching down. It is the fear of pigeon-holing yourself and having to turn down work from other industries who aren't in your targeted niche. Its ok. Your positioning is not set in stone. When you choose a niche, this is just one channel for your sales funnel. You can have many funnels for different industries. What you see on the homepage is only a small bit of what goes on behind the scenes. For example, Matt positions himself as the expert in several different industries and guides the industries of interest to the landing pages that are relevant to them. Sure, he could narrow it down, but what he currently has is working. If he ever wants to change his focus, he can experiment and reach out to new industries. Don't get bogged down in thinking that it must be one niche and that's all you will ever do the rest of your life. You can always change positioning. Although, it does help to have clear positioning with some experience to back it up so the client views you as the expert in that niche. You have followed all the advice on Freelance Transformation and Double Your Freelancing, and now you have more clients than you have time for. First off, congratulations! Second, don't loose focus! Just because you have a lot of clients now doesn't mean that you can sit back and just do client work. In a few months or a year from now, that initial inflow of clients will dry up and there will be nothing left in the pipeline. Always make sure you have a back log. You don't have to be at the celebrity level to have a backlog of clients, you just have to be good at what you do. Backlogs are great for you because you get the ultimate freedom to choose who you want to work with. The worst position you can be in as a freelancer is having to make concessions to a client because you need to pay the bills and will take anything that comes along. That's not fair to you or the client. Backlogs are normally not a problem to the client because they are probably willing to wait to get a really good result. Usually, projects aren't urgent, even though it might be really important to the client. Keep the difference between urgency and importance in mind so when you sign on a client, you can get their deposit to start working with them in a couple months down the line. Built from the successful Double Your Freelancing Clients course, Brennan has made an MBA equivalent for freelancers, Double Your Freelancing Academy. Brennan has designed the course to transform his students' businesses into six figure freelancing businesses. Not only do students learn about what they are supposed to be doing, but the goal is to apply everything to their businesses as they go and have help from experts along the way. The first cohort starts August 15 and will last for 7 months. Each month features a module that teaches tangible skills directly from the experts. First, you learn Positioning with Philip Morgan, then Outreach with Kai Davis, Messaging with Gina Horkey, Offer with Jonathan Stark, Automation with Kurt Elster, Marketing with Mojca Marš, Scale with yours truly Matt Inglot, and Growth with Brennan Dunn. In addition to access to these experts during their office hours throughout the 7 months who can help them with course material and their businesses in general, students also get a dedicated success coach. The coach or personal mentor's job is to keep the student focused on their business goals. All of the coaches are great with people and are all graduates of Double Your Freelancing Clients. The ideal student is someone who is a full time freelancer who has already had some success freelancing. They shouldn't be juggling freelancing with a day job or be brand new to freelancing. Their businesses should be selling and working with other businesses (B2B) rather than to individual customers. The student should be committed to do the work, come to office hours, be open to constructive feedback, and be truly ready to change their business. Just enrolling and joining isn't enough to be successful. Sounds like the right fit for you? Academy is different. It is 7 months of instruction, for people already freelancing/consulting/running an agency who wish to take it to the next level. Each month's cohort is limited to an absolute maximum of 30 students, so you know that you are always in a small group. 1) Website Review Directly From Matt: Matt will provide a website review, redeemable at any time during the course. Matt has multiplied the conversions of his clients many times and has built an entire career around turning visitors into customers. Normally this is a $1,000 value. 2) A copy of The Independent Consulting Manual, a collection of essays on consulting written by a group of expert consultants (some of who are your instructors in the course). 3) 30% off Double Your Freelancing Rate. 4) And if you sign up for the September 2016 cohort which starts September 15, Matt will be your success coach. This bonus is a one-time offer only for that cohort, so if you really want to work with Matt specifically and have access to him throughout the entire 7 month program, this is your only chance.